The eyes are the windows to one’s soul. However, with aging, stress, and inadequate sleep, they can also reveal more than what you’re willing to share - your age. While aging is a normal human process, it doesn’t mean it has to show on your most visible asset. Anti-aging eye creams were specially formulated to help keep your eyes looking youthful and well-rested. Because your eye area is too sensitive to be a trial canvass, we’ve selected the best anti-aging eye creams you can get your hands on. In our review, First Botany Cosmeceuticals Intensive Wrinkle Free Anti-Aging Eye Cream comes with the highest price. However, although expensive, it’s packed with high quality anti-aging ingredients that contain Fiflow, Argireline and Leuphasyl. InstaNatural Eye Ge﻿l, on the other hand, combines Matrixyl 3000 and Hyaluronic Acid to assist in your skin cell regeneration. For its price, it's also the most affordable product you can find in this review. Compared with the other creams, this product can be used all over your face. However, because it has a tightening effect, you may have to be more careful in using the product if you have very sensitive skin. 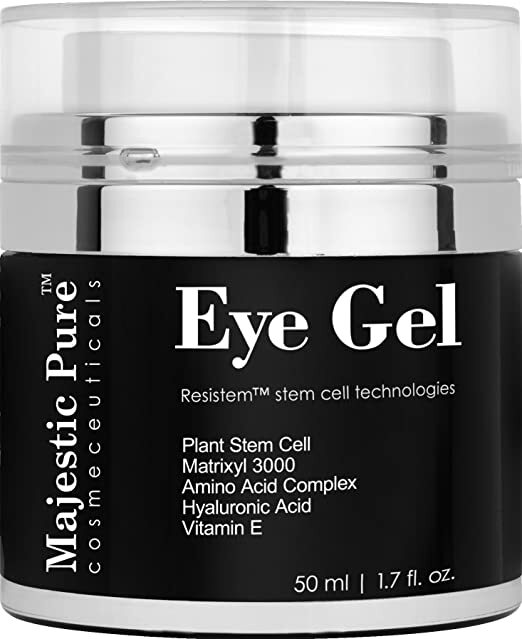 Majestic Pure Eye Gel can bring more value for your money with its newly repackaged 50 mL-container. It has plant Stem Cell and Matrixyl 3000 for sun protection and hydration. Most users of this product find its cooling effect as soothing to the skin. The product has a faint smell which other users didn't favor well. Body Merry Soothing Eye Cream contains around 70 ingredients to minimize wrinkles and even age spots. Although packed with a lot of ingredients, it remains lightweight and easy to absorb. Derma-Nu Eye Wrinkle Cream, meanwhile, contains 72% organic content that makes it safe to use whatever your skin type or condition is. It's also paraben-free and non-comedogenic. It may take a while before visible results with the cream can be seen but there are users who suggest seeing improvements in just weeks. This Intensive Wrinkle Free Anti-Aging Eye Cream from First Botany is packed with tons of anti-aging ingredients that can address not only your fine lines but your puffy eyes as well. Although a bit costly for a 15mL product, its components can surely give you back your money’s worth. The product contains patented ingredients that were all created to meet an aging skin’s needs. For one, it has FiFlow which has the capacity to supply gasses to your skin, particularly oxygen. FiFlow aids in relaxing your muscles and in effective cellular detoxification. Because of these properties, this ingredient can help you achieve both instant and long term benefits. Aside from FiFlow, the cream also has the natural alternative to Botox, which is Argireline. This peptide is proven safe and effective in managing wrinkles around the eye areas. It also has Leuphasyl, which creates a supplementary effect to Argireline’s anti-aging properties. Both of them help make fine lines less noticeable. Most people who purchased the product like that it comes with a pump bottle. It helps make dispensing less messy. The cream has a faint smell which you may or may not like. It has a creamy texture that gets absorbed into the skin very well. Aside from these components, this Selevax cream also has Vitamin C which is known to help minimize hyperpigmentation of the skin. The cream also has Rosehip Seed oil, Sunflower oil and shea butter. This cream has 72% organic content. It works by increasing collagen production to fill fine lines and wrinkles around the eyes. The product is safe to use on all skin types. Because it mostly has organic content, you can also apply it on skin with eczema and acne. It’s non-comedogenic which means it won’t clog pores. The cream is also paraben-free. It has peptide complex, an essential component in collagen formation, and Hyaluronic acid. It also has cucumber and jojoba oil. Although results can be seen in just a few weeks, you may have to wait around 30 days to experience its full benefits. This is probably one of the reasons why a lot of people who used the product didn’t see too much improvements right away. Because of its cucumber content, the product has a bit of cooling effect when applied. It leaves the skin soft and dewy without the oiliness. 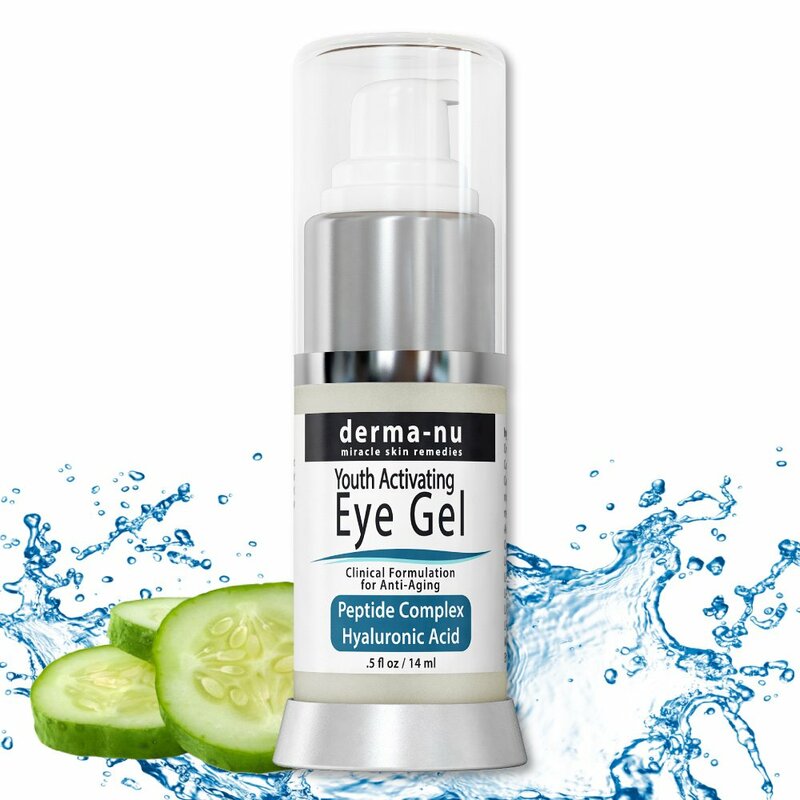 InstaNatural Eye Gel-Cream doesn’t only work effectively on your eye area, but it can also be used all over your face. It can address crow’s feet, fine lines, and even tired-looking eyes. The cream contains organic and natural ingredients which means it can safely be used on all skin types. For its price, you get a 15mL product which is just the right size if you’re a frequent traveler. It has plant stem cells which are known for its ability to help with skin cell regeneration. Aside from Hyaluronic Acid, it also has Matrixyl 3000 that can tighten up saggy and loose skin. The cream has a short drying time and is lightweight. Aside from the cooling effect, you’ll also feel your skin tightening a bit after application. Some people who used the product consider this tightening effect as too much. They describe it as stingy, irritating and even burning. There is also a faint smell to the product which fades away quickly. It also isn’t sticky nor tacky. From 15mL, this product has been repackaged to a 50mL flat top pump bottle for the same price. It combines potent youth restoring ingredients which include Vitamin E, Hyaluronic Acid and Amino Acid Complex. It also has Plant Stem Cell and Matrixyl 3000. These two ingredients enable your skin to be more resistant to sun damage while making it more plump and hydrated. The product is infused with Resistem Stem Cell Technologies. This technology builds and mimics the skin’s natural defense by assisting with skin cell regeneration. It has a tightening effect on the skin when applied. It also works well under makeup and doesn’t cause smearing. The product has a faint smell and has a cooling effect as well. 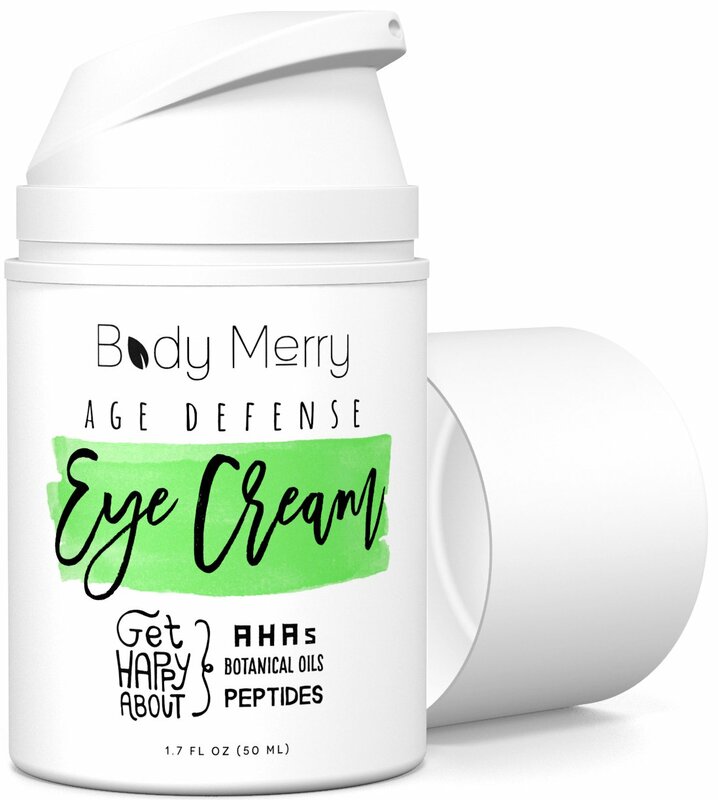 Although some people who used this eye cream have seen a decrease in their eyes’ tired look, there are also people who took time before they saw results with their fine lines. Body Merry Soothing Eye Cream boasts 70 potent ingredients to address the delicate areas around your eyes. The list includes pure plant oils and botanical Hyaluronic Acid. It also has cucumber, green tea and aloe. Although filled with a long list of ingredients, the cream isn’t sticky nor tacky. In fact, most people who bought the product find the cream easy to absorb. It won’t also make your eye area feel heavy. It has a very faint herbal scent that doesn’t stay too long. It comes with a pump bottle which tends to dispense more product than needed. A lot of users find the product helpful with their dark under eyes. It also helps diminish their dark and brown spots. While using a moisturizer on your face can help keep it nourished and supple, it might just not be enough for the sensitive skin around your eye area. Studies suggest that the skin around the eyes has less sebaceous glands which predispose it to form more wrinkles than the rest of your face. It also has smaller pores, which means the thicker formulation of face moisturizers won’t be able to easily penetrate your skin. Eye creams are specially formulated to address these delicate structures of your eye area. Using an eye cream is not only limited to restoring youthful skin. As a matter of fact, using it as early as your late 20s to early 30s can protect you from showing the early signs of skin aging. Aside from maintaining your youthful skin, regular application of your eye cream also helps makeup application go smoother. It prepares the skin to hold pigments and color longer. Because an eye cream is different from your face moisturizer in a number of ways, it also involves a more delicate way of application. In case you’re one of those people who wonder “what goes first”, then this list can surely help you. Take a small amount of cream and apply on the eye area. Use a gentle and dabbing motion along the contour of the eye. Be careful not to tug the skin. Pat the cream from inner to the outer counter. Make sure to move upwards toward the brow area. Allow the cream to dry thoroughly before applying any cosmetic or other skin care products. You should also avoid applying too much product as it will only irritate your eyes. A pea-sized amount should be enough to cover both eye area. Eye creams are best applied before your moisturizer as this product helps seal the cream better on your skin. Vitamin C is one of nature’s most potent anti-oxidant. It helps fight off the damage brought by the sun, stress, and harmful toxins your skin encounters every day. Aside from this property, Vitamin C also has the ability to boost your collagen production. Collagen is what your skin needs to maintain its elasticity. As you get older, your skin’s ability to produce collagen greatly decreases. In effect, every expression, such as blinking, smiling or frowning, leaves fine lines and wrinkles on your face. Coenzyme Q10, or more commonly known as CoQ10, is naturally produced by the human body. However, with aging, stress and particular medicines, such as cholesterol-reducing medications, this ability greatly declines. CoQ10 is what enables your skin cells to fight stress and regenerate. Without enough CoQ10, such as when you reach your 30s, your body becomes inefficient in producing essential skin molecules like collagen and elastin. Niacinamide, Nicotinamide or simply Vitamin B3 has been well-known for its tons of skin benefits throughout the years. As a matter of fact, it’s been widely used to address and treat Pellagra, a condition that results to dermatitis, diarrhea and mental symptoms. In terms of skin aging, Niacinamide can greatly improve your skin’s natural barrier by enhancing the production of elastin and other related components of your skin’s outer layer. This vitamin is also capable of increasing your skin’s resistance to irritating skin care ingredients, including Sodium Lauryl Sulfate. Retinol can do a lot of things for your skin when it comes to slowing down the signs of skin aging. Aside from boosting your skin’s elasticity, it also decreases the rate at which collagen is broken down. Other than these benefits, applying retinol topically also hastens your skin’s turnover rate. You may see this effect as peeling and redness on the area. Because there’s peeling, most people who have used retinol assumed that it thins the skin. However, what it does, in reality, is thicken the skin by addressing its deeper layers where wrinkles generally start to form. ​Alpha Hydroxy Acids generally comes from fruit as well as milk sugars. The most common type of AHA you’ll see in skin care products are glycolic and lactic acid. AHAs facilitate exfoliation to allow new skin cells to grow. Because of this effect, this ingredient is found effective in smoothening out wrinkles and roughness of the skin. It’s also capable of increasing collagen and elastin production. It even works well in addressing brown spots and damages caused by excessive exposure to UV rays. Using an anti-aging eye cream doesn’t have to wait until you already have wrinkles and fine lines. In fact, using it as early as your 20s can help limit the signs of skin aging from showing on your face. 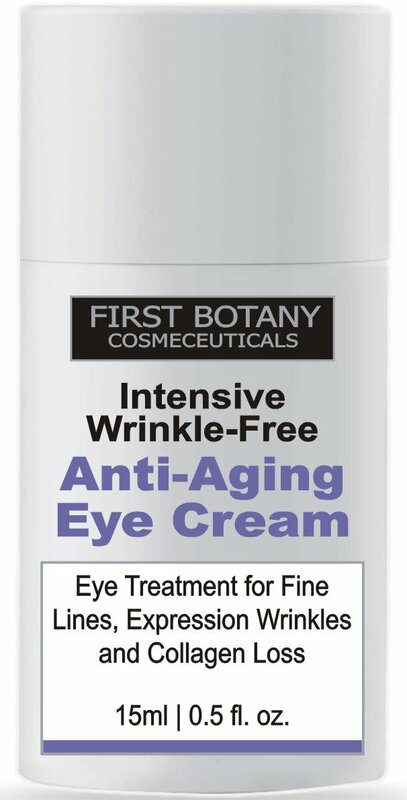 In our review, we found First Botany Cosmeceuticals Intensive Wrinkle Free Anti-Aging Eye Cream as the best anti-aging eye cream on the market. Although it comes with a higher price tag than most creams, it’s packed with patented ingredients specifically formulated to restrict the signs of skin aging. We also liked that it comes in a pump bottle that makes dispensing easier. This bottle, however, is only packaged in a small 15 mL container. Myth or Truth: Does Chocolate Cause Acne?